The Joseph Fund of Camden has announced three local business executives as chairs for the Annual Hand Up Gala, its signature event, including Mt. Laurel resident Rhonda Costello. 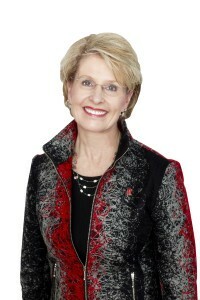 Costello currently serves as executive vice president/chief retail officer of Republic Bank. The other chairs of the event include Susan Barrett of Haddon Township, and independent financial advisor and James K. Wujcik and Cinnaminson, regional director of business banking for Santander Bank. Mt. Laurel resident Rhonda Costello.Together the three will lead the charge for the highly anticipated Gala scheduled for Saturday, Oct. 29 from 6:30 to 11:30 p.m. at The National Constitutional Center in Philadelphia. The festive, black-tie-optional affair, which attracted more than 350 guests last year, will feature dinner and dancing, live music by the “Motor City Revue,” a silent auction, live auction and more. Hand Up Gala event proceeds will benefit those in need who seek affordable housing, homelessness services and a quality education. The Hand Up Gala is based on the philosophy that giving people a “hand up” instead of a “hand out” has a much more profound impact on their lives — it builds self-determination and raises aspirations so that with a “hand up” anyone can soar. The Joseph Fund is a nonprofit dedicated to supporting the missions of six Camden organizations that provide educational opportunities, permanent housing solutions for lower-income individuals and solutions to end homelessness for those willing to receive a hand up. The three event chairs also currently serve as board members for The Joseph Fund. For more information about sponsorship opportunities or to learn more about The Joseph Fund, contact Jim Catrambone at (856) 576–7012 x617 or jcatrambone@josephfundcamden.org or visit http://josephfundcamden.org/hand-up-gala/.